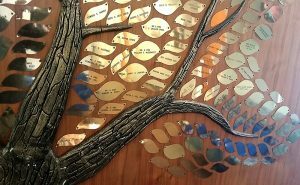 The Family Tree in the CHS main lobby is a proud testimony to our most generous supporters over the years, and commemorates individuals in whose memory gifts have been made. The Tree stands not only as a symbol to our family of supporters, but also to the thousands of families of this Commonwealth that we serve through our continuum of services, providing lifelong relationships for infants, foster care children, young adults no longer in foster care, adoptive parents, and even birth parents or adoptees seeking reunions. Located on the main wall in our waiting area, the Family Tree is a brass sculpture of a tree with its trunk and spreading limbs. Surrounding the Tree are many individual brass leaves, which serve as permanent plaques engraved with the names of generous donors. In some cases sponsors have chosen to memorialize their loved ones. The Tree was started as part of a capital campaign in 1992, and continues to grow and shelter the Children’s Home Society. We are thankful to add more and more leaves of various sizes and origins. 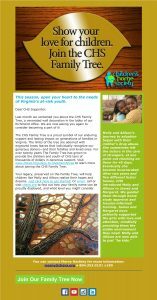 There are many inspirational stories of love and generosity associated with our Family Tree. We invite you to visit us to see the tree. Take a close look…perhaps you might recognize someone! Honor a loved one. Recognize your family, or an adopted child. If you would like to be recognized on our Family Tree, or would like to memorialize a loved one, please consider a gift at one of the levels below, and let us know how you would like to be recognized. You will be forever remembered and displayed as a true champion for our mission: to provide permanence for Virginia’s at-risk children and young adults.